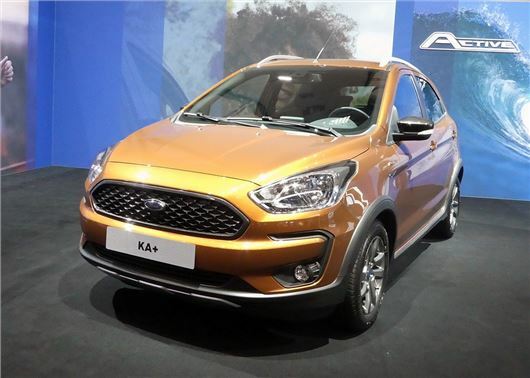 Ford has launched a beefed up version of the Ka+ at the Geneva Motor Show 2018. Called the Ka+ Active, the city car gets crossover styling and will start from £10,795 when it goes on sale in the summer. The Ka+ Active has a 23mm raised ride height and features wheelarch cladding and roof rails. It also comes as standard with 15-inch alloys and a new metallic orange colour called 'Canyon Ridge', so you don't forget that it's aimed at those with an active lifestyle. The engine range includes a new three-cylinder 1.2-litre Ti-VCT petrol engine available in two versions - either 70PS or 85PS - along with a 95PS 1.5-litre TDCi diesel engine. As well as being more fuel efficient, the 1.2 engine offers up to 10 per cent more torque at low rpm than the previous 1.2 Duratec engine, although Ford hasn't released any economy figures for the new engine. All models get electric front windows and door mirrors, remote central locking, Hill Start Assist and a speed limiter as standard. The engine now starts with the push of a button and the bootspace is easier to access with a tailgate-mounted switch for easy opening (in addition to the interior release). The introduction of the Ka+ Active coincides with an update to the Ka+ range. All models are now available with Ford’s SYNC 3 communications and entertainment system, rain-sensing wipers and automatic headlamps.